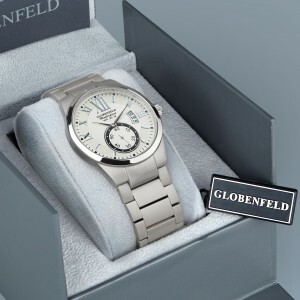 Globenfeld is a name synonymous with fine craftsmanship. Marcus Globenfeld was born in 1914 and from that time the Globenfeld family were involved in the creation of fine timepieces. In the modern era, to continue the Globenfeld tradition, their descendants have endeavoured to ensure that Globenfeld watches are both stylish and practical.. The new Globenfeld range echoes this desire with models specifically designed for the fashion conscious and sports oriented people of today, people who are equally at home whether in the boardroom or on the sports field.